Comprised of 3 parts New Orleans, 1 part Ireland, a shot of German and just a spritz of Tiki. 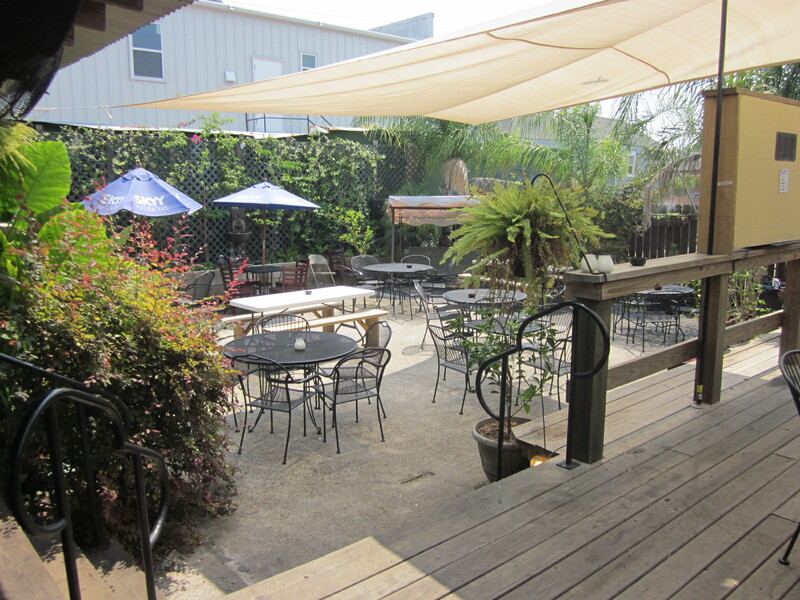 Let’s geaux and check in with your friendly neighborhood beer garden! 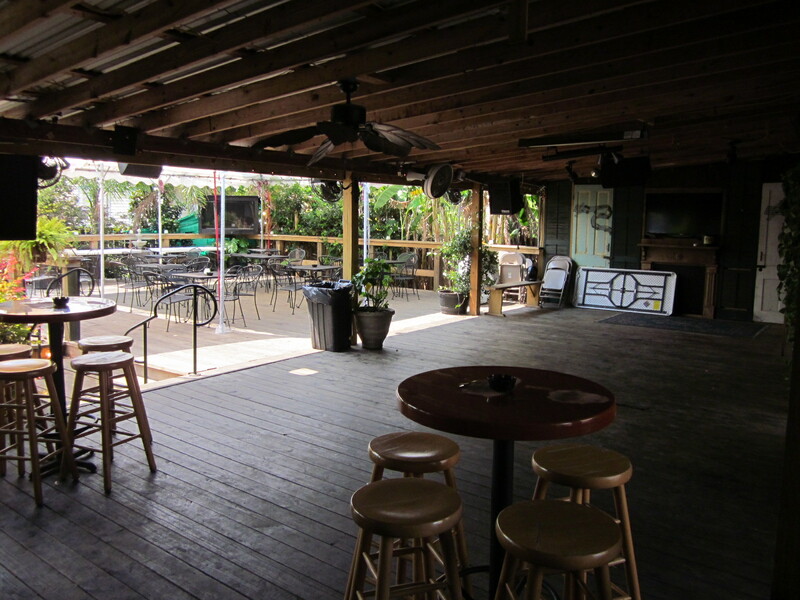 Wander to the back patio and deck area where your senses will be fully permeated with the sights of luscious flowers and vegetation coupled with the soothing sounds of a flowing waterfall as refreshing calypso, reggae, and other popular music selections play in the background. 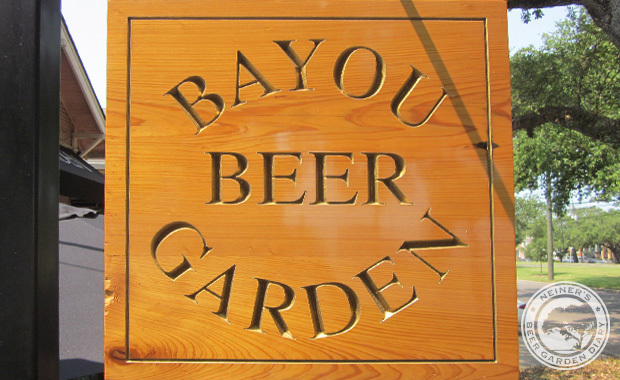 After my strange night at the RV park, I make an early start for The Bayou Beer Garden in New Orleans. They open at 11am, and I want to get there for some lunch. It’s early and there’s a clear and vast view across the lake as I drive over the Pontchartrain Causeway into the city. I drive around the city a bit since I have some time to kill. Bourbon Street, cool. Superdome, smooth. Canals, purdy. I am noticing on my GPS that the elevation is constantly negative, at some points by 15 feet! All of the sudden I remember that I had forgotten about Katrina and that most of this was under water not too long ago. It is a strikingly beautiful day outside. 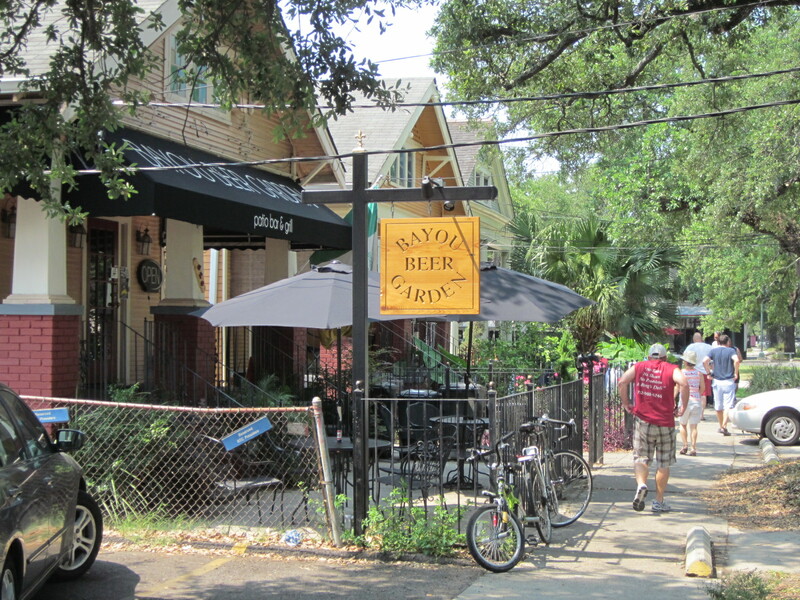 I drive a few minutes outside the main downtown area and through a beautiful Live Oak lined street to the Bayou Beer Garden at around 10:57am. I park in the free smallish parking lot out back and I can see a wonderful little garden area. It looks quite pleasant, almost grandmotherly. As I walk around the block to the front of the bar, I see that it is not open yet. There is a yard sale going on next door, and as each person walks in and out of it, I wonder “Is this the Bayou owner?” Until, alas! A woman walks from the sale, over to the Bayou and opens the door! I’m in! 11:02! She is not the owner, but she is the bartender and operator. Her name is Kelly and she’s from Canada. 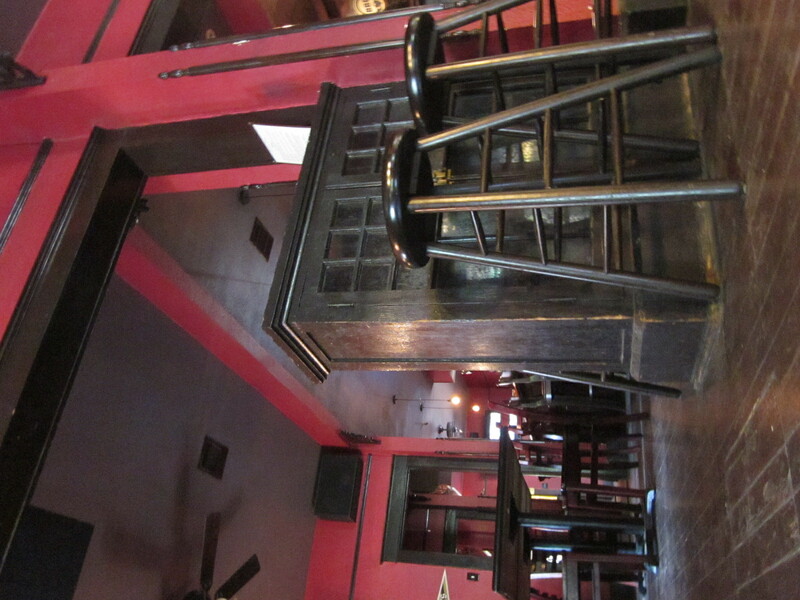 I walk through the inside bar area and it is typical with its’ eccentricities. The bar used to be a house, so the fixtures and flourishes are all old-timey New Orleans and beautiful. I can’t really get a vibe on a theme, except that there are Irish touches, mixed with Louisiana knick-knacks. But, all of the regular bar staples are there: pool table, cigarette machine, darts. There are also a few gambling machines scattered throughout. I make my way out to the back to the garden. It is a little odd how quiet it is since I am literally the first customer of the day, but it let’s me relax and take everything in. First impressions are that this feel like a Tiki bar. 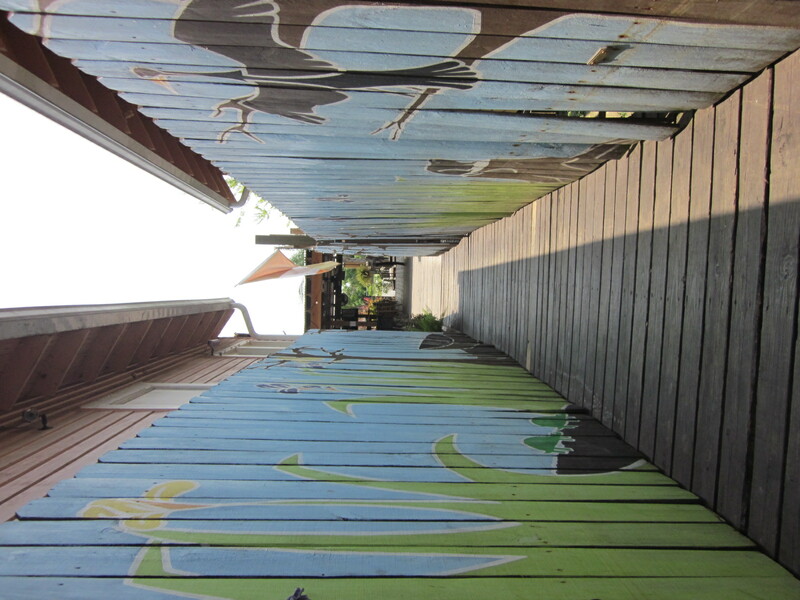 The backyard space is all wooden deck with a palm trees lined up behind the barrier fence. 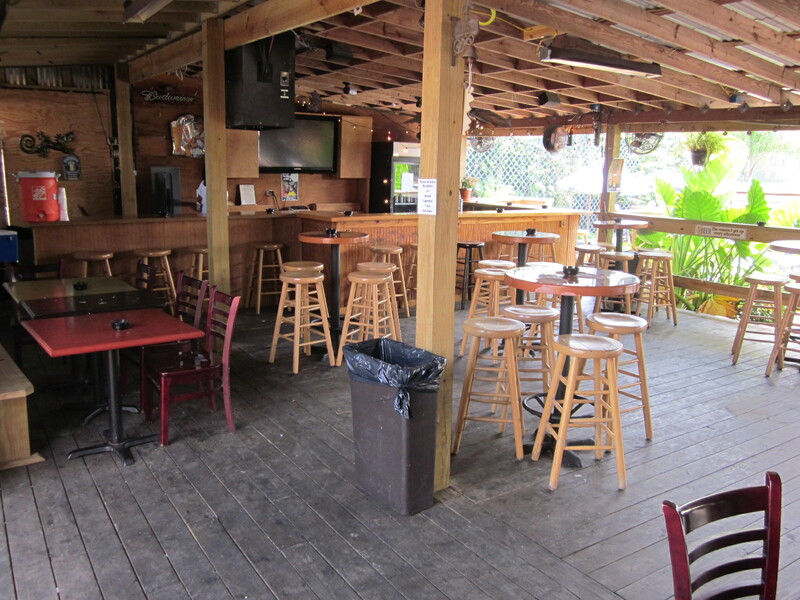 There is an outdoor bar under the large corrugated tin roof that takes up half of the outdoor space. The other half is a sunken garden area with finely crushed white gravel on one side, and a space under a big free standing tent-thing with a slew of round wrought iron tables. I am struck by the variety of everything, and I mean everything! In this space, there are tons of different kinds of tables and seating. Then the plants. Potted, planted, trees, shrubs, flowers, ferns, vines, etc. You can sit or stand under the roof, in the garden, at the bar, under the tent. 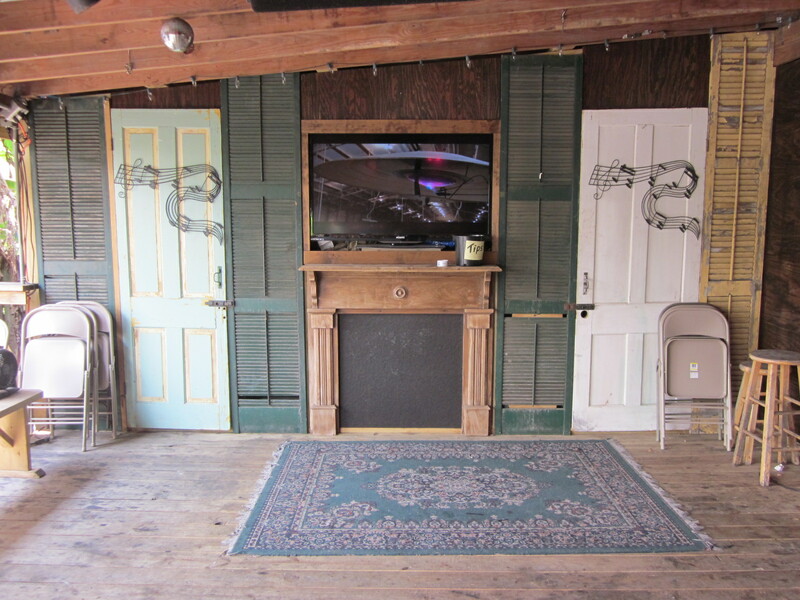 The decorations feature themes from LSU football to geckos to german beer to whatever! If that isn’t enough for the 200+ people that could fit back there, there are 6 large flat screen TVs and a nifty little un-elevated stage area for local Jazz musicians to perform. It is unfortunate that I can’t really see the place in action! Unfortunately, I am in the garden alone. 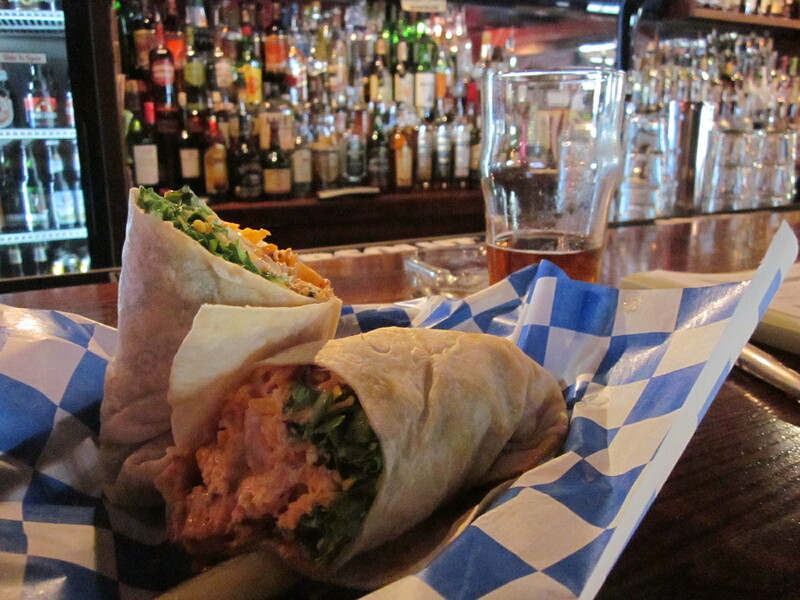 So, I slink back inside to the bar so I can talk to Kelly and order some food. She is super friendly and indulges my questions happily. 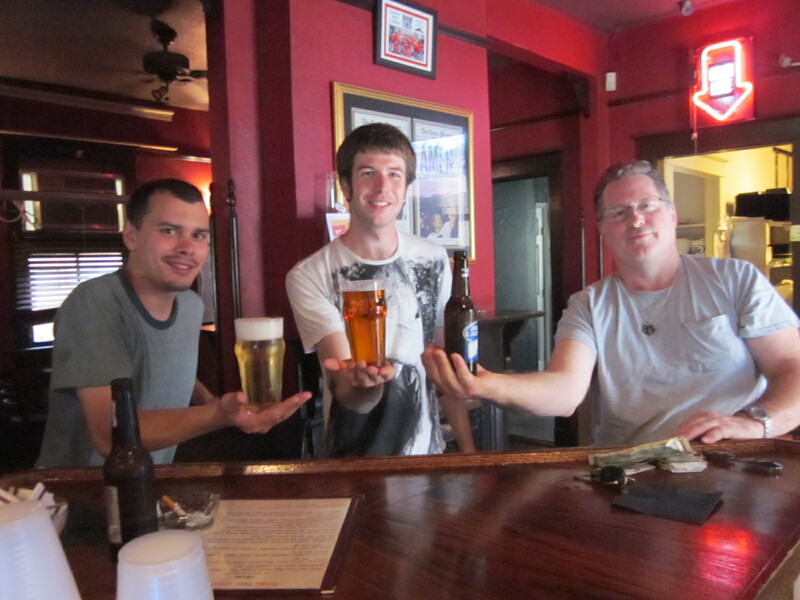 She tells me that the New Orleans bar scene is heavily influenced by the Irish community. 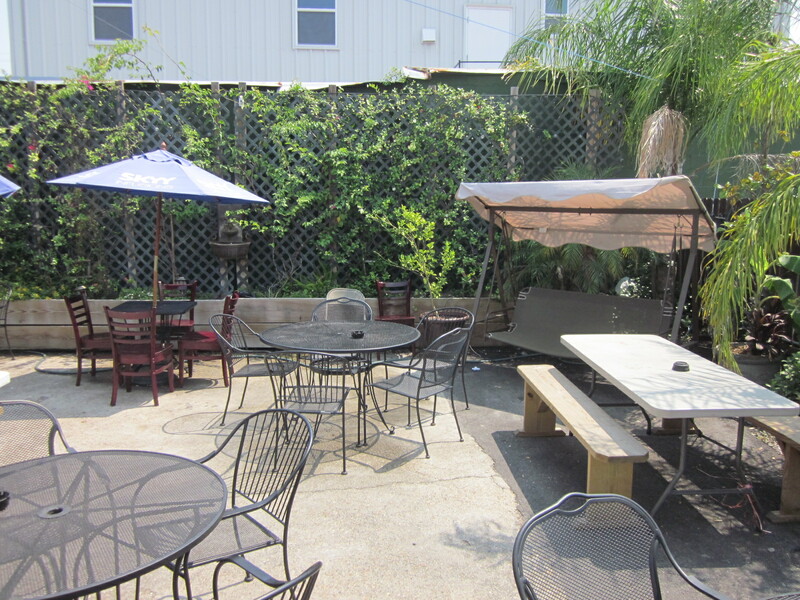 In fact, the Bayou Beer Garden’s Irish owner used to work with a few other folks at an Irish bar called Micks, and all of them split off and made their own bars in the city. Ultimately, a few patrons trickled in as lunchtime came. They are all friendly and I get the unmistakable vibe of neighborliness. This feels like the place you stop by for a quick chat if you have a free minute on your way to pick up the kids. It’s smattering of knick-knacks don’t feel contrived. In fact, there seems to be a story behind each one. It feels the opposite of corporate. Like each touch was hand placed once, and just left where it lay. It is a comforting feeling that I haven’t quite experienced anywhere else. Kinda like grandma’s house!… with a pool table and a cigarette machine. Thanks for sharing your experience… I am right back in the middle of a lovely courtyard surrounded by life! All the while I am snuggled inside on this wet, cold, and yes, snowy Memorial Day weekend here in Montana.